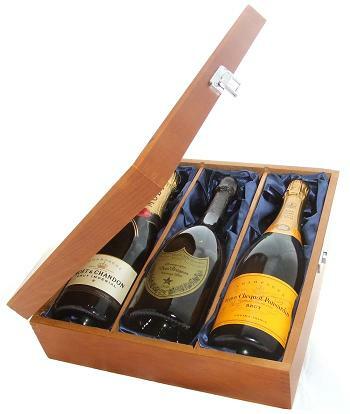 The champagne trio sets available online here at Gifts International are a luxurious and sophisticated gift choice. All come from top brands including Moët & Chandon, Armand de Brignac, and Dom Perignon. While some cases feature three bottles of the same champagne, we also offer variety sets that contain complementary bottles of varying types, vintages or brands. If you can’t find the perfect combination, you can simply purchase a gift box and select three single bottles of champagne to go inside. Order a champagne trio gift today. Most UK orders are delivered the next working day, and international shipping is available.